1. Stir together the flour and paprika. Place the seasoned flour, eggs and breadcrumbs separately into 3 shallow bowls. Dust the fish with the flour, shaking off any excess, then dip into the egg and finally the breadcrumbs. 2. Heat a little oil in a large frying pan over medium heat. Cook the fish, in batches if necessary, for 3–4 minutes on each side until crisp, golden and cooked through. Drain on paper towel. 3. Meanwhile, stir together the mayonnaise, dill and cornichons. Split the bread rolls in half and spread the bases with the dill mayonnaise. 4. 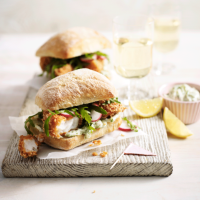 Divide the crispy fish pieces between the rolls, and top with the radishes and rocket. Place the top of the bun on and serve the butties warm with a lemon wedge on the side. If you want to serve these as a starter or lighter meal, simply leave out the bread rolls and serve them on their own with salad leaves dressed with the dill mayonnaise.